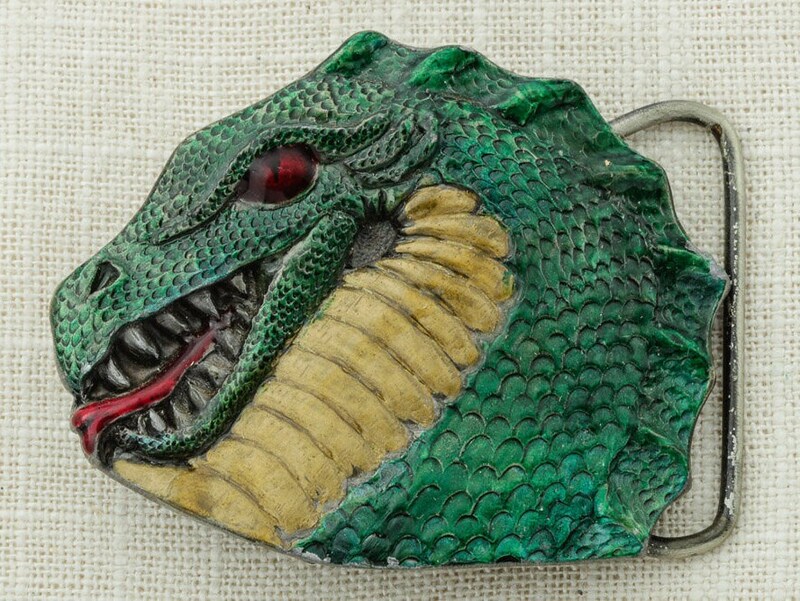 Awesome green and gold enamel dragon head with red eye and tongue. 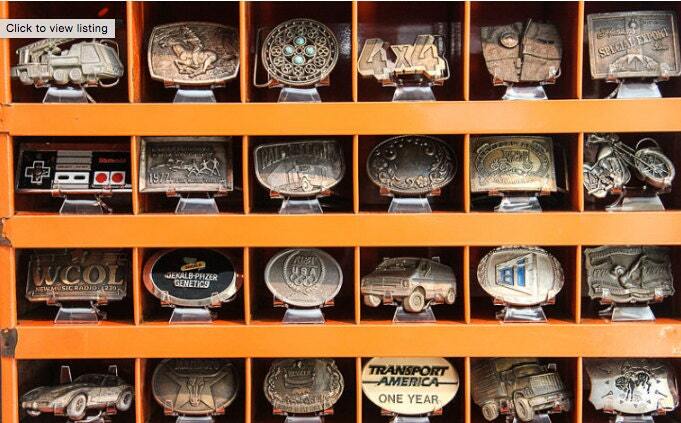 Buckle is in good vintage condition with normal wear. Measurements: 2.75" wide (all measurements are approximate). Fits a 1 3/4" wide belt. We ship 5 days a week and will attempt to get your item in the mail same day (the next morning, at the latest). Packages are shipped USPS First Class & Priority. If a quicker delivery window is needed or insurance is desired please contact us. We will send you a revised invoice for changes to shipping method. International Shipping is done USPS First Class. Please inquire for insurance or a quicker delivery. We will send you a revised invoice for changes to shipping for all international shipping. We will assume your PayPal or Etsy address is the address to ship to unless otherwise notified. Any duty or customs fees you may incur are your responsibility. Vintage Diehls does not pay import fees to your country. Normally shipping takes around 10 business days, but sometimes customs holds up the process. We wait 6 weeks before issuing a refund for a missing package. We rarely have package take this long, but it is even more rare to have a package disappear. If you are not satisfied we want to know. Please send us a message immediately (before leaving feedback) to give us a chance to make it right. Returns are accepted for items within seven (7) days of arrival. Please read full "Refund Policy" for other situations that may occur. In most cases, shipping back is at the expense of the buyer. 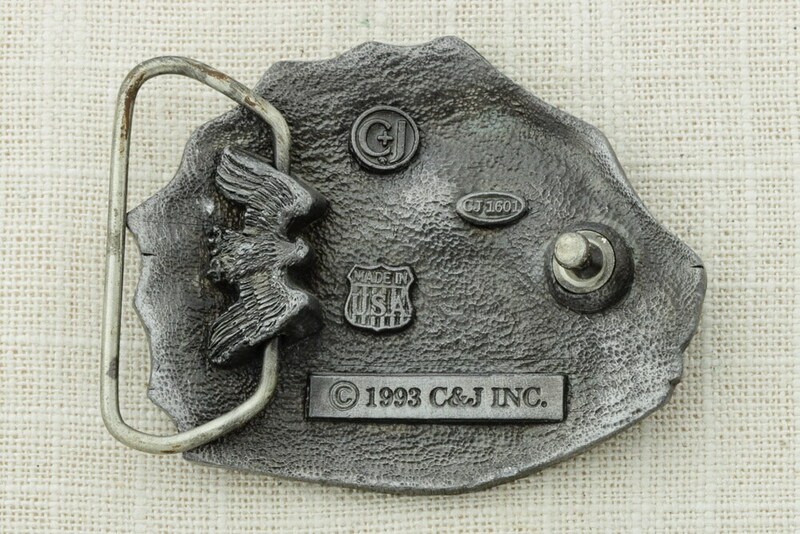 Contact us if you believe we made a mistake in photographing or describing the item. Items should be returned in the same condition and in original packaging before refund is issued. Your purchase will be refunded minus the cost of shipping. SHOES / APPAREL - We attempt to give all sizing we can for you to make sure it will fit. We will offer a refund for the item minus a 10% restocking fee and shipping. Shipping back to Vintage Diehls is at the buyers expense. If we made an error in the listing information please let us know and we will address it. If a piece is damaged upon arrival please let us know. In addition if a piece is in a different condition than conveyed through the listing, contact us. In these situations a full refund may be possible. International returns: refunds are given on a case by case basis. If you have a problem with your order, please message us right away. Duties and import fees are always paid by the buyer and they cannot be refunded. Above all if there is an issue just contact us. We want to make it right. Please reach out through a conversation with any questions or concerns. We look forward to having repeat buyers and want everyone to be as happy with their items as we have with so many Etsy items we've purchased. Wholesale is definitely an option. Please contact us to discuss. We are always shopping! Please let us know what you might be looking for and we can try to find it. We love to hear from our customers, so don't hesitate to reach out!!! Please contact us if anything would keep you from leaving positive feedback. We will do anything we can to fix your issue. Absolutely! We combine shipping in the US and internationally. In the US, once you add the first item to your cart, most other items ship free (some exclusions apply). We will ship in the most economical way internationally. We will always issue a partial refund if actual shipping cost is considerably less than what was calculated when at the time of checkout. As fast as lightening. No, seriously. We have a staff of three people who work full time to get your items photographed, listed, and more importantly, shipped. Most orders go out the same day (sometimes they're packaged within minutes of purchase), and the latest an order would go out is the next business day, depending upon what time you place your order. US holidays and some exclusions apply. As always, let us know if you are in a rush to receive your item and we'll work to get it to you as quickly as humanly possible. Reach out to us right away (before leaving feedback)! We work very hard to keep our 5 star average and we're proud to have thousands of happy customers around the world. If something about your order isn't quite right, it's our pleasure to work with you to come up with a solution that'll make you happy. When you say gold, do you mean 14k? We love gold and silver around here, but we are not in the fine jewelry business and RARELY sell items that are 14k gold or sterling Silver (if so, we'll mention it explicitly). Instead, when we use the words "silver", "gold", "copper" or "unicorn", we are simply describing the color or appearance of the item. Buyer is responsible for customs, duty and import fees. Please check your local customs rates as they vary around the world and are frequently changed.